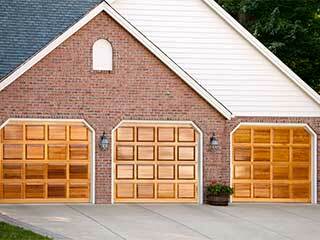 Your garage door makes up a large percentage of the viewable area of your house when someone passes it on the street. Naturally, it’s an important aspect of a residential property’s resale value, and something that most homeowners carefully consider before undertaking an expensive home improvement project. That’s why it’s great to know cheaper options available to you if you're planning a face lift for your door. There are many things you can do to increase your home’s aesthetic and curbside appeal without spending a ton of money. Here are a few ideas from us! Replacing the garage door itself can be a big step, but with careful selection that matches the overall tone of your house, it can be a budget-friendly option as well. Even relatively cheap options such as aluminum overhead doors can look very pleasing to the eye with the right coat of paint. A more modern door can also work wonders for the visual appeal of your house, even if it’s not terribly expensive. A fresh coat of paint is even more inexpensive if you're not currently considering a new door. Choosing a color that accents or highlights the best features of your house can draw the eye, and dramatically increase the curbside appeal of your home. According to studies, replacing and upgrading your garage door is one of the most cost-effective methods of improving the resale value of your home. Every penny you put into a new garage door, you're likely to get back as the value of your home increases. You’ll also reap the rewards of increased interest and foot traffic if holding an open house. In our experience, a well-kept and attractive garage door is something people really notice as the first indication of a property's upkeep as a whole. If you're interested in exploring ways to revamp your garage door further or think it's time you arranged a new door installation, our experts are here to help – call us today!